Natural blackberry flavor perfectly captures the taste of freshly picked blackberry. No artificial sweeteners, the sweet flavor and aroma creates the perfect pastries, cakes, drinks and more! 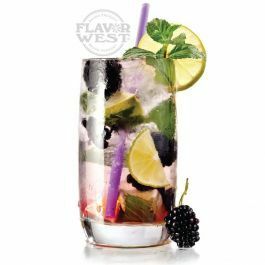 Type: Blackberry Mojito Water Soluble Flavoring. Ingredients: Natural and Artificial Flavoring, Propylene Glycol. USP Kosher Grade Flavoring. Usage Rate: 15-20% for E-use. Flavor suitability: Desserts, pastries, yogurt, ice cream, drinks and beverages, candies and more. Specific Gravity: 1.08 No Refunds on Flavoring.